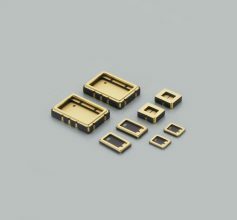 NTK LCC Packages for SAW/Crystal devices are low cost surface mount packages that are suitable for small footprint applications. Ideal for traditional CMOS image sensors, MEMS packaging, and handset products that include SAW filters, crystal oscillator filters, TXCO, DPX, and antenna switch modules. Base materials can be co-fired multi-layer. Multiple build up layers are possible with Copper Polymide (CuP).